Please be aware that in recent weeks several current bankruptcy clients from multiple law firms in the Chicago area have been victimized or attempted to be victimized by a fraud scheme. This is how the fraudulent effort plays out in essence. There are two specific individuals that play a part in this scheme. The first is a person who alleges to be a bankruptcy attorney from the law firm that the debtor hired and the other party alleges to be a creditor who must be paid. This all takes place in the evening after the law firms have closed and where verification becomes problematic. The fraud scheme starts with the criminal obtaining bankruptcy case information from the public access website. The criminal then calls the actual debtor and adjusts the caller ID to make it seem like it is coming directly from the debtor’s law firm. The criminal identifies himself as an associate attorney from the law firm and gives a fake name. He mentions that despite the fact that the bankruptcy case has been filed; the debtor must pay a specific creditor to avoid a jail sentence. This person then directs the debtor to call an additional party, the creditor, who is in on the fraud. That party then directs the debtor to go to a MoneyGram or Western Union or some other way to wire funds to a third party. The debtor believes that everything is valid since the call was initiated purportedly from the debtor’s law firm, and the debtor is able to speak to the alleged associate attorney as well as the alleged creditor. Unfortunately, several debtors in Chicago have gone ahead and wired money to this third-party in New York. Once this is done, it is impossible to stop the flow of money as the wiring facility has no duty or obligation to go after that criminal. For this reason, debtors must be on alert. If you receive a phone call after hours from someone purporting to be from your attorney’s law firm, listen very carefully to what they say. Your bankruptcy attorney will never ask you to wire money to a creditor to avoid incarceration. Further, you should always ask for information to be sent in writing, whether it is a fax, email, or letter. Most importantly, get in touch with the contact person at your attorney’s firm. If the debtor would attempt to call the firm and speak to an attorney that they know, this fraudulent activity would cease. It should not surprise you that individuals prey on other individuals and scare them with jail in order to extract funds from them. Always be vigilant and never wire money to anyone other than a family member, friend or someone that you know very well. 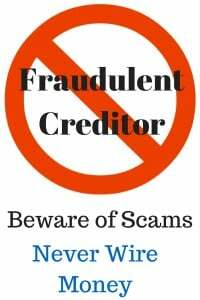 Never wire funds to creditor especially when you have already filed for bankruptcy relief. Scam artists will stoop to the lowest levels. Lower than you can actually believe. Don’t be a victim of this ruthless scam.